Side effects may include dizziness, an increase in business activity, and rational exuberance. 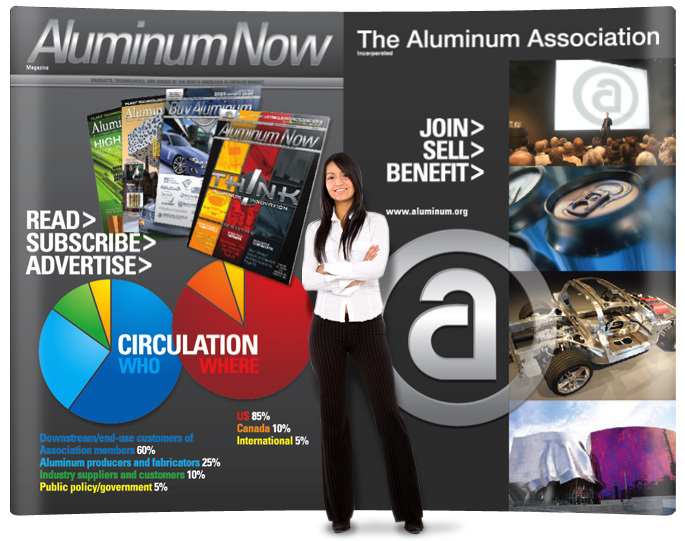 After we helped rebrand the image of their Aluminum Now magazine to better serve their members, the Aluminum Association asked us to help them create new ads, banners, and a booth for the upcoming National Manufacturers Week trade show in Chicago. 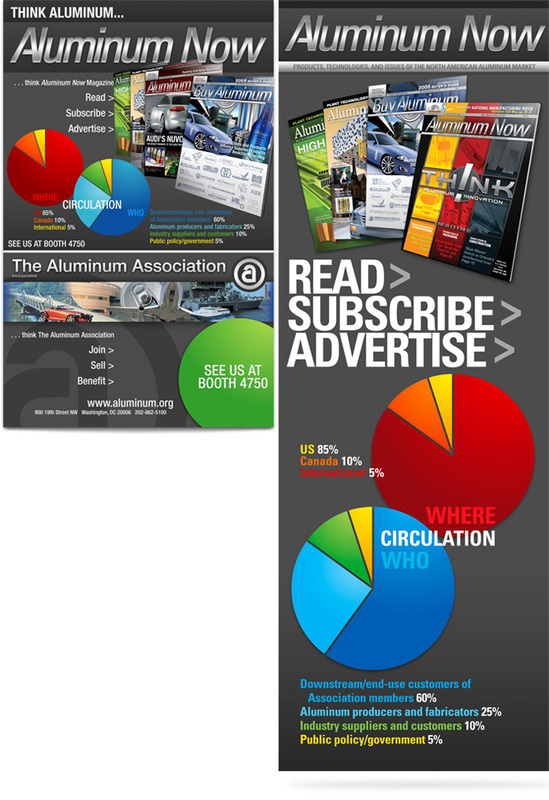 Design a booth, banner, and ad that would help the editor of Aluminum Now increase traffic and subscriptions during a large tradeshow in Chicago. Transfer the redesigned look of the magazine over to a booth wall and include charts that will highlight the diverse readership and distribution areas without being overwhelming or confusing. With the traffic zooming by, we wanted to keep things simple. So we made the freshly redesigned magazine the hero to highlight one of the major benefits of becoming a member. © Innov8iv Design incorporated. All-media image, identity, and brand development. Graphic design and marketing services for corporations, non-profits, and associations since 1989. An international design firm with designers and technical consultants in the Washington, DC, Chicago, and Toronto metropolitan areas, and clients in the U.S., Canada, Central America, Spain, Sweden, and London. IDI welcomes new clients and invites you to visit the online project portfolios to see sample design projects in the following categories: Web-based & Digital (website design, email newsletters, e-commerce solutions, video, corporate presentations, blogs, custom CMS, etc. ), Print Projects (magazines, brochures, posters, postcards, banners, displays, manuals, books, mass mail pieces, etc. ), Branding / Identity (logos, marketing campaigns, ads, creating a common visual language for all your company communication), and Event / Experience (tradeshow booth design, signage, kiosk videos, hanging banners, pull up displays, pop-up displays, etc.) Hosting provided by (mt) mediatemple.net.